Product liability law holds the manufacturer or vendor liable for injuries caused by a defective item. When a consumer purchases a product, they expect it to be safe and effective. Even though manufacturers have a responsibility to provide consumers with safe products, they are sometimes more concerned with making a profit. Whether its a car, toy or a household object, as a consumer you expect the goods that you purchase to be manufactured so that they are safe you to use. Sadly, thousands of consumers are injured every year by poorly designed and manufactured items that they use at directed by the manufacturer. If a consumer has been injured while using a product, they may be able to file a product liability lawsuit. Have you or someone that you love suffered an injury due to the malfunction of a defective product? If so, you or that person may be eligible to file a damages lawsuit. At the law offices of Greg Coleman Law, we have recovered hundreds of millions of dollars in compensation for our clients and will fight for the justice that you deserve. For immediate assistance contact us today at (865) 247-0080 or simply fill out and send the "Free Case Evaluation" form to the right. There are three main types of liability lawsuits - defective product design, defective product manufacturing or failure to warn of product defect. With this in mind, if you or a loved one has been injured due to a defective product, you may have grounds to file for compensation. Most defective item claims are often filed under a breach of warranty, consumer protection or negligence. In many instances, these cases can become quite complex, and often involve teams of litigators and other parties that are intent on proving that the claimant is wrong. .... just to name a few. At the law offices of Greg Coleman Law, we have won over $250 Million in settlements for our customers, and have the knowledge and resources to compete against the types of large firms and corporations that are often involved in these types of product liability claims. We firmly believe that everyone deserves access to comprehensive legal counsel. With this in mind, we work on a contingency basis, which means that we do not charge for our services unless we obtain a settlement for you. If you are unsure if you have a case, we also proudly offer a "FREE CASE REVIEW" - where one of our attorneys will review the details of your claim, and then determine if you have grounds to file a lawsuit - for free. If so, we will advise on the best way to move forward with the litigation. Need Help? 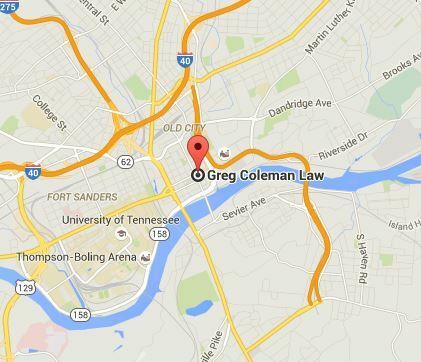 Contact Our Lawyers In Tennessee Today! Consumers that have been injured by a defective item may be entitled to compensation for medical expenses, loss wages and pain and suffering - the experienced and knowledgeable attorneys at our firm can help determine if you are eligible. In the event that the manufacturer's negligence is found to be criminal, a consumer may also receive compensation for punitive damages. Punitive damages are rewarded if the defendant acted in utter disregard for the consumers rights or interests. If you or a loved one has been injured by a defective product, you need an experienced attorney on your side. When it comes to product liability cases, time is of the essence. To contact our attorneys, call us today at (865) 247-0080 or simply click "here" and fill out the "Free Case Review" form. We will contact you upon receipt of your message to further discuss the merits of your claim.